A majority of the programmable logic controller (PLC) programs will include a timer instruction. The BRX series of programmable logic controllers have several different timers available for your program. There are nine different basic timing instructions in the PLC. The memory area for timers, include the Timer PVs (Present Values) Timer SVs (Set Values) and the Timer Completion Flags. 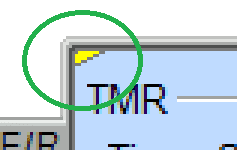 The default size of the timer area is T0 – T255. This size can change to the amount that we need for our program. Please see BRX PLC Numbering Systems and Addressing on how to change the memory configuration of the controller. 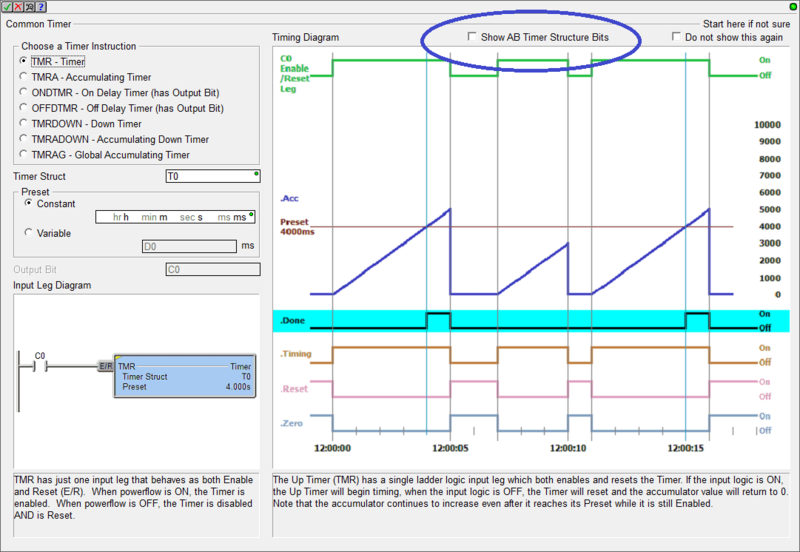 We will be looking at the timer instructions in the BRX PLC along with some programming examples. As a system integrator, this ability can prove very useful to you in the field when commissioning your automation system. When dealing with timers, we need to look at timing charts. The Secret of Using Timers is a good refresher on using timing charts. Let’s get started with the BRX PLC Timers. When the input is off the timer is reset. When the input is on the timer will time up for the set amount of time. (5 seconds) After the time expires the done bit will turn on causing the output to turn on. This has the timing chart of an on delay timer. When the input is off the timer is reset. When the input is on the timer will time down for the set amount of time. (5 seconds) After the time expires the done bit will turn on causing the output to turn on. When X2 is on the time accumulates. When X2 is off the time accumulation stops. After the time accumulation reaches the set point the done bit of the timer will turn on. The reset will happen when the input X3 is turned on. The timing chart is an on delay as well. We just have a separate input for the reset. When X4 is on the time accumulates downward. When X4 is off the time accumulation stops. After the time accumulation reaches the set point the done bit of the timer will turn on. The reset will happen when the input X5 is turned on. When the timer times out the done bit is set for the timer number. When the input turns on the output bit C0 also turns on. The off delay timer times when the input turns off. The output bit will remain on for the timed value. This is the off delay timing chart. The on delay timer will delay the output from coming on for the set time interval if the input is on. If the input condition goes off, the timer resets. The frequency timer will calculate the counts per second, minute or hour that an input is coming on/off. There is a filter constant that can be used on the output during the calculations. The output is a real number. The instruction also has a built in scale that we can scale our output to a meaningful value. You can watch the video below to see how the different timer instructions in the BRX Series PLC. Next time we will look at counters in the BRX PLC. There has been an update to the BRX PLC. Do-More Update release 2.1. They have also added AB/Rockwell Timer bit fields – .TT (Timer Timing), .DN (Done), .EN (Enable) These bits will behave just like the AB Timers. The behavior of the existing Do-More Timer bits has not changed. This will make those familiar with Allen Bradley timer programming more comfortable with the Do-More Designer programming. For additional updated features, please refer to the updates.pdf file in the installation folder.